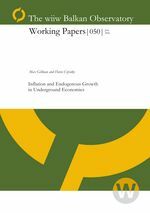 The paper examines the effect of inflation on the growth rate in economies with underground, or ”non-market”, sectors. The model incorporates a non-market good into an endogenous growth cash-inadvance economy with human capital. Taxes on labor and capital induce substitution into the non-market sector which avoids such taxes. However the non-market sector uses only cash for exchange and cannot avoid the inflation tax, while the market sector allows costly credit use. We estimate a MIMIC model for latent underground economy using monthly data for Bulgaria, Croatia and Romania. Furthermore, we estimate a dynamic structural equation model and investigate short-run effects of the underground economy on output growth and test for Granger causality and long-run cointegrating relationships using bivariate Granger-causality tests and Johansen’s maximum likelihood technique. The result indicate different shares of underground economies across the three countries and a positive long-run effect of underground economy on output growth.